It is fascinating to observe how something becomes a global icon. Consider how everyone in every country seems to know that a bright red circle-and-slash logo means “forbidden,” or that five interlocking rings symbolize the Olympic Games. In a similar vein, America has given the world community the international symbol of hospitality: the pineapple. Food historians say that pineapples originally evolved and were cultivated in the tropical areas of Brazil and Paraguay, spreading through trade to the islands of the Caribbean, where the native Carib Indians called it “anana”, or “excellent fruit”. The intensely sweet treat was a staple of special feasts and religious events and was also used to produce wine. Explorer Christopher Columbus encountered the pineapple during his second voyage of discovery to the New World, when he and his crew landed on the island of Guadalupe. Columbus brought the succulent delicacy back to Spain in 1493, calling it a “piña”, because of its outer resemblance to a giant pine cone. The piñas were an instant sensation throughout Europe and quickly became a prized commodity. European horticulturists struggled for nearly two centuries to develop a way to cultivate pineapples in hothouses. By the 1600s, pineapples were being produced in Holland and England and had achieved status as a coveted indulgence. Indeed, an official portrait of King Charles II in 1675 shows the monarch receiving the first pineapple grown in England as a gift. 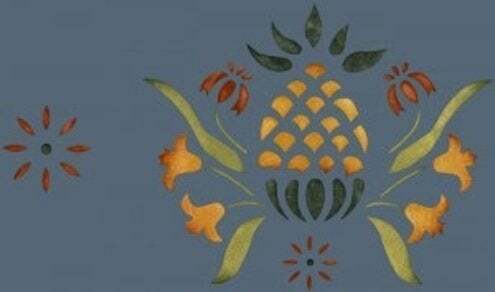 European colonists brought their love of pineapples to America in the 1700s, where the still-rare fruit became a symbol for a home’s of warmth and hospitality. Because trade routes between New England and the Caribbean islands were slow and dangerous, it was considered the height of generosity for hostesses to purchase a pineapple for guests. Additionally, New England sea captains often placed ripe pineapples in fence posts outside of their homes as a symbol of their safe return from a voyage. In order to further extend a warm welcome to visitors, pineapple motifs were carved into bedposts or headboards in the rooms given to overnight guests. 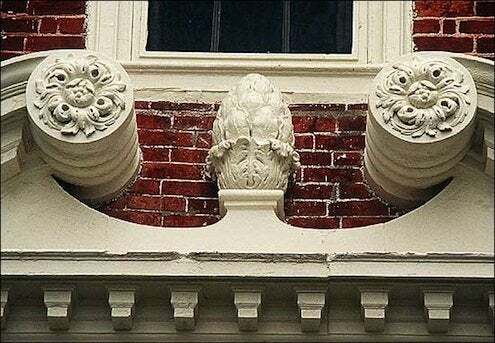 Architects, designers, and craftsmen quickly adopted the motif throughout the United States in the 1800s, using carved wood and molded mortar pineapples as gate posts, and copper and brass pineapples as weather vanes and house signs. Pineapples also were carved into entry doors, window frames, shutters and stair risers, and they were stenciled or painted on walls, floors, and ceilings. Today, pineapple motifs continue to be prevalent in building materials and home decor. 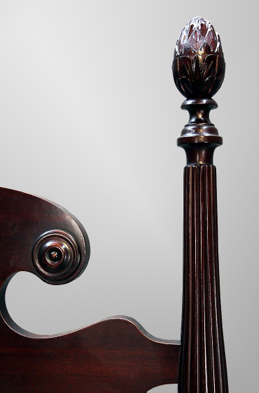 Due to their natural cylindrical shape, they lend themselves well to millwork items, such as post caps, finials, and capitals. Pineapple shapes also are used as decorative elements for knobs, drawer pulls, drapery hardware, door stops, garden statuary, lamp bases and chandeliers. Artistic renderings of pineapples can be found in stained glass windows, mirrors, floor tiles, backsplash tiles, mosaic tabletops and ceramic stepping stones. On the softer side, pineapple designs crop up frequently in decorative fabrics, wallpaper and borders, accent rugs, doormats, wall plaques, decorative flags, bed and bath fashions and especially in table linens. Ceramic, crystal, wood and metal pineapples are employed as freestanding decorative elements in many homes throughout the world today, proving that this motif says “welcome” in any language!